Virtual Measuring Room | Mentel Co.,Ltd. The Virtual Measuring Room has become an indispensable tool for automated 3D digitalization. Based on the ATOS Professional software, GOM offers an additional VMR software module. With VMR, the user only has one single button for complex measuring cell programming. This guarantees high functionality and reduced complexity. In addition, increased workflow safety and considerable time savings can be realized. The Virtual Measuring Room (VMR) is a virtual, yet functional representation of the real-world measuring environment. The VMR is a fully integrated solution for the complete reproduction of automated measurement process chains within one single software package. The VMR workspace, which includes an auto-teaching function, reduces programming time and the need for specific robot programming skills. The software automatically generates the correct sensor position for each feature being measured. During path optimization for the ATOS ScanBox, the software automatically calculates intermediary positions along its travel line in order to preclude collisions. At the same time, the duration of travel and robot movements are optimized by making adjustments to the sequence of positions. 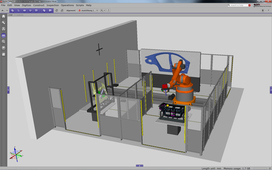 The Virtual Measuring Room guides users safely through the measurement and inspection process and offers numerous advantages: shorter ramp-up times during the implementation of inspection tasks and simplified measurement workflows, higher process safety and shorter turn-around times for new parts, faster teaching, both online and offline, with the same tool, as well as collision control for a higher safety level, and an optimization of robot processes before the start of actual movements. The Virtual Measuring Room supports the industrial integration of automated quality control cells with sustainable analysis workflows, even over multiple departments and locations. VMR, in combination with parametric and traceable inspection workflows in GOM Inspect Professional, opens the path for uniform and centralized part inspection management. Kiosk Interface is the next step towards automated process control. It is a human machine interface for simplified interaction with ATOS inspection cells. The Kiosk Interface automatically handles the complete measurement and inspection workflow. As human interaction is reduced, high precision and data quality are guaranteed.